People love finding shortcuts and hacks to make their lives easier. There are entire books, websites, and podcasts devoted to life hacks that are guaranteed to save you money, time, and hassle. But these shortcuts don’t only apply to the everyday person—businesses love them as well. Lots of blogs and videos talk about various hacks and tricks to do things like boost conversions and drive higher traffic to your pages. However, many tend to have little real proof the hacks will actually make any positive impact on your marketing strategy. But, there are a few that are actually worth their weight in conversions and have the data to prove it. We’ve rounded up the top four that can make a noticeable difference to conversion numbers if you incorporate them into your marketing plan. Let’s discuss the four marketing hacks that actually convert. There’s a huge difference between an annoying, intrusive pop-up and a strategic pop-up. 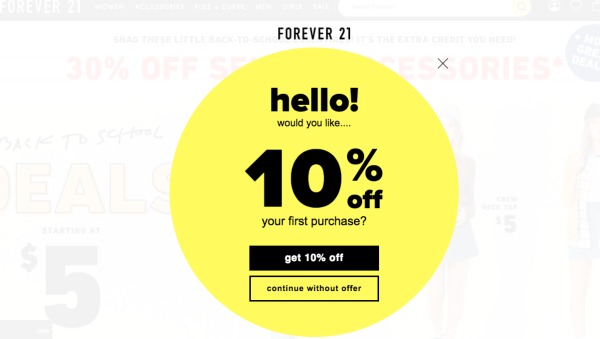 Lots of websites have their messages pop up on the screen almost as soon as the visitor arrives at the page, like this one on Forever 21’s homepage. It immediately takes over the entire screen and stops the shopper from doing what they originally intending to do. While the offer is a great one, not everyone is a first-time shopper so the message may not apply to a large majority of the visitors. Plus, this interruption is the exact reason why 95 percent of consumers have a negative attitude towards pop-ups on websites. To get better conversions from pop-ups when selling online, you'll want to make sure your pop-up messages are used strategically to entice visitors to stay on your website longer and spend more money. 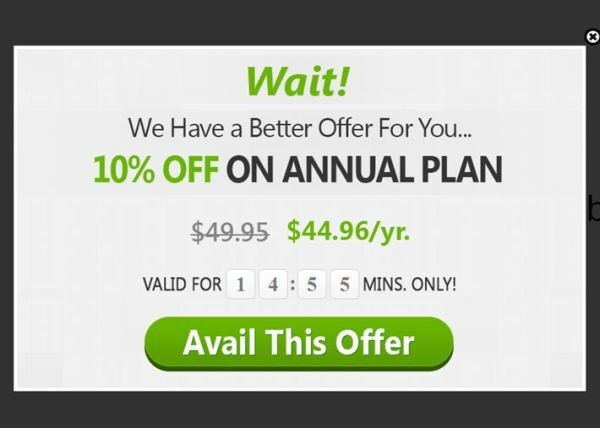 Exit pop-ups are a great way to reduce the number of bounce rates, especially accidental exits. These messages are called responsive pop-ups because they appear based on the customer’s actions, such as moving their mouse towards the exit button or scrolling quickly on a mobile screen. Three case studies found that when an exit message was combined with an obvious benefit to the customer, conversion rates bumped up by 27 percent. Offering a free product, like access to a report or ebook, a special 15 percent off offer on their purchase, or a free trial, all helped to keep people engaged in the website longer and resulted in higher conversion rates. Pop-up boxes have long been a tool that marketers use to gain the attention of prospective customers and ask them for information, like their email address or a quick survey question. Simply having pop-up messages alone certainly doesn’t qualify as a hack—but placing them strategically throughout your site definitely does. Of course, marketers can’t seem to stop talking about AI and how it’s going to entirely transform the business world as we know it in the next few years. Just over half of the world’s leading marketing teams are using this technology, which goes to show that AI is surely a wise long-term investment. Automation is one of the best AI related hacks out there because it saves time, and therefore, money. AI-enabled chatbots take this one step further by creating an entire army of sales representatives that work around the clock to increase conversions. Thanks to impressive machine learning technology, chatbots are becoming more engaging and less robotic, leading to better conversations and conversions. Salesbots can also be used to help customers with service issues, and can even recommend upsells and cross-sells. 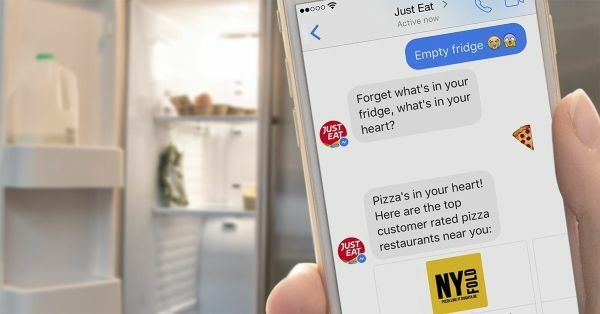 In fact, the salesbot that Just Eat used had 266 percent higher conversion rates than their social media advertisements. The reasoning for this hack is clear: a chatbot works 24/7 and is far more engaging than a static ad. It asks you what you want and gives you the exact information you need (if programmed correctly). Due to its highly responsive platform, 37 percent of American consumers report they would gladly buy something through a chatbot service. Personalization is one of the most powerful tactics a marketing team can employ. Again, thanks to AI technology, this is finally possible, and consumers know it. That’s why 65 percent of consumers agree that customized experiences from brands influence them to make a purchase. One of the best hacks for making personalization a regular part of your marketing strategy is building customized landing pages infused with consumer data. While this may sound a little complicated and technical, it’s actually pretty simple—with the proper datasets from your analytics. Personalization can be as simple as mentioning your customer’s name somewhere on the page, or as complex as sending personalized shopping suggestions based on previous behavior or past purchases (something that Amazon does amazingly well). One truly shocking statistic is 100 percent of marketing teams that use personalization report at least one benefit from it, and 74 percent saw a direct link to increased sales. To create these personalized landing pages, you’ll first need to have a robust database of information on your customers. This can be gathered from various sources, such as sales data, demographics, or social media analysis. From here, it’s just about finding the right tool to integrate this data into your webpages. There are plenty of programs out there that can help create customized landing pages that will adjust to integrate information about each customer for a personalized experience that converts. First things first, what is interactive content exactly? Well, just like the name says, it fosters an interaction between the customer and the brand. This is done by requiring the consumer to complete an action to receive something they want, such as a quiz to see which product is right for them or sharing a social media post to enter a giveaway. Buzzfeed does an excellent job of this with their sponsored quiz posts—which will literally suggest products for you or just blatantly display a brand’s products throughout the questionnaire. Not only does this strategy delight readers, but it also gives brands amazing consumer data and can boost conversion rates by up to 60 percent. Interactive content is certainly not a new concept, but its use as a highly converting marketing strategy is. The key is to make it beneficial for both your goals and the customer. Give your audience what they want (whether it be personalization, entertainment, or assistance) and give your marketing team access to incredible consumer behavior data for a true win-win kind of hack. 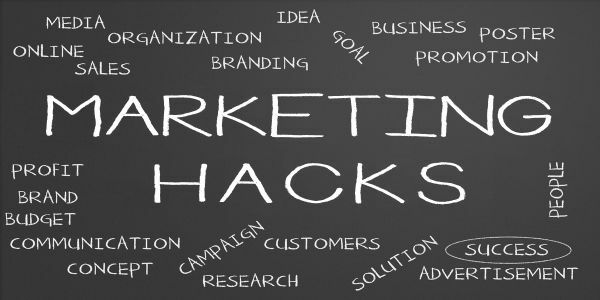 Not all marketing hacks are created equal, and some definitely stand out amongst the crowd. While an increase in conversions isn't the only way to measure a marketing hack’s worth, it is certainly a positive outcome. Over the years, these top four tips have stood the test of time and proven themselves to be highly converting hacks.